At some stage during the fifteenth century, a group of seafarers formed a charitable guild on the quayside of Newcastle to support the town’s growing maritime community and their dependents. Originally named the “Guild of the Blessed Trinity of Newcastle upon Tyne”, they formally came into being on 4th January 1505, securing some land, previously known as Dalton’s Place, in Broad Chare on Newcastle’s Quayside, from Ralph Hebborn, in exchange for a “peppercorn rent”, being a red rose, to be paid yearly on demand, on the feast of John the Baptist (now known as Midsummer’s day). An order was made on that day for the building of a hall, chapel and lodging rooms on the site. This same document required the appointment of Aldermen and Wardens of the fellowship and of a priest “to sing and say mass and other divine service”. Poor persons admitted to the Chapel were required to pray for the good estate of Ralph Hebborn and his relatives, the soul of John Dalton and his ancestors and for Brethren past and present. 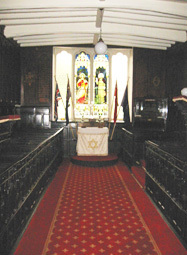 Up to this time, we know that the Brethren had their own altar, or chantry, in All Hallows Church, which stood where All Saints Church now stands, on the hill overlooking the eastern end of the Quayside. On 9th September 1524, Thomas Hebborn, the son of the original benefactor, gave more land to the Guild, this time in exchange for a “pottle of wyne” (a container holding half-a-gallon, or 2.3 litres), this time to be paid yearly on demand, on the vigil of Saint Peter and Saint Paul, being the 29th June. By this time, their aims were also developing along professional, as well as charitable lines. The River Tyne at this time was described as “a tortuous, shallow stream, full of sand shoals, impeding flow from the harbour entrance up to Walker, with the river as high as Newcastle fordable at low tide”. It was an everyday sight to see small schooners and brigs lying aground at Newcastle and the Brethren of Trinity House were able to bring their expertise to bear in improving standards and facilities. On 5th October 1536, this work was given due recognition in the form of the first of seven royal charters, this being from Henry VIII. At the same time, the fraternity became an incorporated “Company” within the town of Newcastle upon Tyne . Out of 28 Companies in the City today, the Newcastle upon Tyne Trinity House is one of just three which have received their own royal charters. The first charter permitted the Brethren of the Newcastle upon Tyne Trinity House to levy dues on ships trading into the river Tyne and its out-creeks, at the rate of two (old) pence per English ship and four pence per foreign ship. It also however required certain duties in exchange from the Brethren, principally that they “build, fortify, moat, embattle and garrison two towers on the north side of the entrance to the river Tyne ”, in which would be maintained lights for the safety of navigation. These were the original “High and Low Lights”, later versions of which stand at North Shields and are used as leading lights by today’s vessels. The House’s area of responsibility eventually extended from Berwick-upon-Tweed in the north to Whitby in the south and the Corporation established buoys and beacons, licensed Masters, Mates and Pilots, advised and oversaw improvements within the rivers and ports, continuing to finance this work through the levying of dues. Successive charters increased the rates and expanded the powers and responsibilities of the Corporation. The Board decided in the early years of the eighteenth century to open a Free School to provide an education for the children of Brethren. The doors opened on 9th May 1712 and the accommodation – the dormitory – was originally the cellar under the Chapel. This changed in 1753, when the Schoolhouse was rebuilt and extended. Around this time, navigation was also incorporated in the curriculum and the School opened to older boys and men. Examinations were introduced “to ensure that students were fit and proper persons to become officers and take command at sea”. 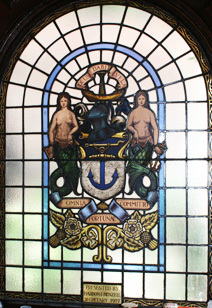 Reflecting the Corporation’s origins as an incorporated Company, many of the students were apprenticed to “Free Mariners” and in time themselves became members of the Newcastle upon Tyne Trinity House. The first Schoolmaster, a Mr Manell, was employed at an annual salary of £16, quite a respectable income in 1712. Later Schoolmasters included the renowned Mathematician Robert “Beau” Harrison in 1756 and John Fryer, the land surveyor famed for his maps of both Newcastle and Northumberland, in 1771. Edward Riddle was Schoolmaster between 1814 and 1821, when he was appointed Master of the Royal Naval College, Greenwich. 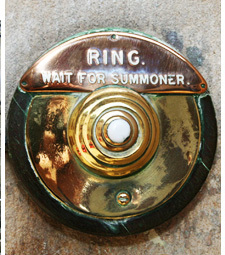 The School closed in 1870, but the building still exists today and has most recently been used as barrister’s chambers. On the charitable front, the House built a succession of alms houses on its property, housing seafarers and their dependents in need. Several sets of these dwellings survive today on the land around the House and have been adapted to various uses. In the late 1840’s, local shipping and business interests began lobbying for a change to the way in which the river Tyne was controlled and run by Newcastle Corporation and the Newcastle upon Tyne Trinity House. In 1849, it was proposed that the entire control of the navigable waterway of the river should be transferred to a new Commission. Initially opposed, an amended proposal the following year resulted in the Tyne Improvement Act which commenced this process. The new Commission, full of good ideas, was soon to discover that it was lacking in both expertise and money and always struggled to keep pace with the increasing volume of traffic in the river. A few years later, bowing to continuing pressure from shipowners and foreign governments, Queen Victoria authorized an enquiry into the levying of dues on ships, which led in the end to the “Harbours and Passing Tolls Act” of 1861, a move that effectively destroyed the system of dues which had been built up since that first Royal Charter and on which the Newcastle upon Tyne Trinity House very much depended for the bulk of its income. Significantly, foreign ships were no longer compelled to take a pilot and, if they did so voluntarily, they paid the same rates as British ships. Along with the Newcastle Trinity House, these measures severely impacted the commercial activities of the Company of Pilots at Dover, the Fraternity of Hostmen at Newcastle, the Trustees of the Totnes Charities, the Trinity House at Kingston-upon-Hull, the Society of Merchant Venturers at Bristol and the Russia Company, all of which derived their income, in part or in whole, from charges on ships in their own areas of responsibility. 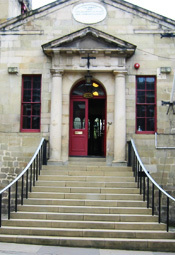 The way in which Trinity House administered its charitable work was also subject to new regulation, likewise affecting the Kingston-upon-Hull House, the Society of Keelmen of Newcastle upon Tyne, the Trinity Corporation of Leith, the Guildry Incorporation of Perth and the Fraternity of Masters and Seamen of Dundee, all of which amassed and dispensed charitable funds and assets in a similar way. All rates, dues, duties and imposts levied by any charitable authority on ships, or goods carried in ships except for shipping purposes, were to cease within a few years of this far-reaching Act. In 1865, the Tyne Pilotage Board was formed and this took control of the licensing and administration of River pilots on the Tyne, again a function previously performed wholly by the Newcastle upon Tyne Trinity House. 1883 saw the transfer of the High and Low Lighthouses and the Groyne Light to the Tyne Commission. Blyth Pilots became independent from the Newcastle upon Tyne Trinity House Control in 1922 and various other districts separated in the following decades. More recently again, in 1993, responsibility for the inshore buoyage from Blyth to Holy Island was passed to the General Lighthouse Authority and the buoys and marks in the same area around Holy Island itself followed two years later. The Newcastle upon Tyne Trinity House has retained its professional interests however and today remains an active examining and licensing authority for Deep Sea Pilots, qualified to operate from Gibraltar to the North Cape, as well as assisting with the examination of local pilots and supplying expertise in other maritime matters. The House runs an Education and Training programme, which includes coordinating visits by Sea Scout and Sea Cadet units to places of maritime interest, such as the Port of Tyne, the local Marine Police unit, the Marine Safety Training Centre at South Tyneside College and the local RNLI station. Groups of school children also visit the House and take part in the innovative and engaging “School’s Challenge”, a team quiz which introduces them to the history of the Newcastle upon Tyne Trinity House and the maritime heritage of the City of Newcastle and the surrounding region, encouraging them to explore many of the more fascinating artefacts on display. An exclusive Corporate Membership scheme is operated, making the House available to members for prestigious business or social events. In exchange for the unique setting and atmosphere that the Newcastle upon Tyne Trinity House provides, member’s subscriptions go towards the preservation and maintenance of the buildings. Much of the surrounding Trinity House property is now leased to a variety of professional tenants, including barristers and the Live Theatre and again the income derived from rent is directly applied to conservation, education and charitable welfare. The House continues to be governed by an annually-elected Board, very much aware of its traditions and heritage, yet equally focused on the challenges and opportunities of the future.